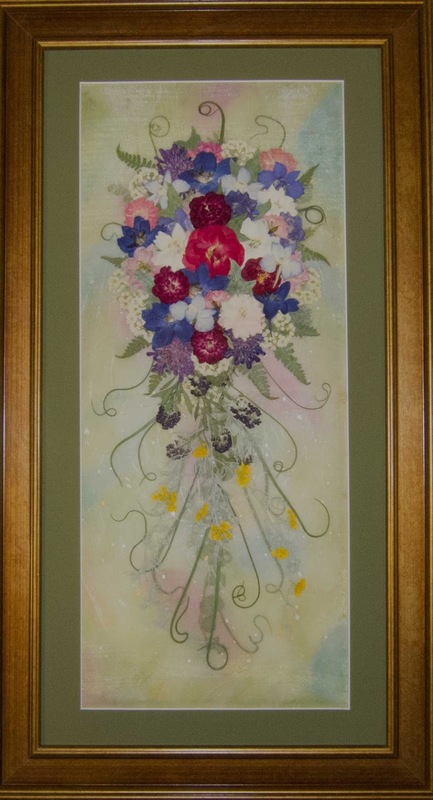 This piece features a typical Chinese background consisting of botanicals layered between a sheet of translucent paper and sheer fabric over a pastel colored base. I believe this technique would be especially beautiful for a wedding bouquet. 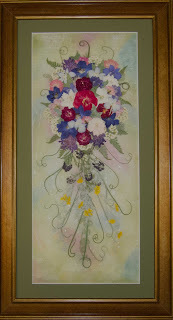 My picture features roses, larkspur, delphinium, bridal wreath, scabiosa, alyssum along with miscellaneous fern and leaves. The flowing tendrils were primarily from wild onion and silver mound artemisia. It was vacuum sealed between a layer of mylar and glass and topped with 99% UV conservation glass for added protection.